Trey Capnerhurst, a traditional witch, performs a naming ceremony by the altar in her backyard in Alberta. (CNN) - Like lots of people, when October 31 rolls around, Trey Capnerhurst dons a pointy hat and doles out candy to children who darken the door of her cottage in Alberta. But she’s not celebrating Halloween. In fact, she kind of hates it. Capnerhurst says she’s a real, flesh-and-blood witch, and Halloween stereotypes of witches as broom-riding hags drive her a bit batty. “Witches are not fictional creatures,” the 45-year-old wrote in a recent article on WitchVox.com. 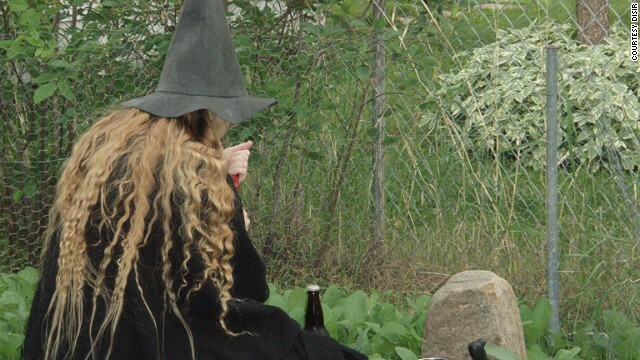 Warts or not, many witches say they have mixed feelings about Halloween. (CNN) - A cute little boy joined Pope Francis on stage in St. Peter's Square last weekend during a Catholic celebration of the family and refused to leave, forcing the pontiff to put Jesus' words about "suffering" the little children into practice.